When hearing this particular adage bandied around it’s easy to forget that, in relation to many other forms of art and entertainment, cinema is still a relatively young medium. Literature, theatre, fine art, sculpture et al all predate it by centuries, even millennia, and yet, perhaps due to it’s completely symbiotic co-existence with and dependence on technology, and that it came about in the most technologically progressive century history has known, perceptions on the history of cinema and it’s various ‘eras’ seem as intricate, thorough and divisive as any other art form. 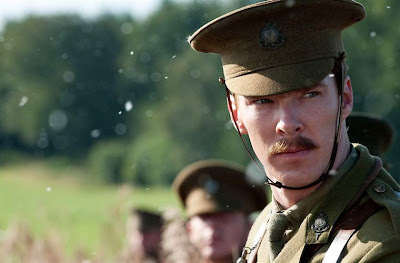 However, having recently viewed both War Horse and The Artist recently, it is re-assuring to see contemporary filmmakers defying such attitudes and providing films which deftly go against any such simplistic thinking that certain styles and attitudes towards creating cinema have been lost to yesteryear. War Horse is the latest epic offering from maestro Spielberg, based on the novel of the same name by Michael Morpurgo and the subsequent hit stage production which opened to rave reviews back in 2007, and, much like The Artist, everything about it feels like an homage to cinema ‘of old’, an almost timeless piece which carries more than echoes of Ford, Lean and, in the drench-soaked grittiness of The Somme, Kurosawa. And yet as much as it harkens back to more classical cinema both in structure and style, we are undeniably in Spielbergian territory, from his confidence and invention with camera (a stunning passage following Joey, the titular horse, as it attempts to escape a battlefield is a masterful flurry of tracks and cutting) through to his assured handling of pace and narrative - willing and certain as he is of giving incidental characters moments to shine and allowing the overall flow of the film to give pause where more conventional filmmakers would be ferociously butchering in the edit to create a tighter, less resonant third act. that less confident filmmakers would leave to the cutting room floor. As can be expected when Spielberg handles films of this scope and calibre (see Munich, Saving Private Ryan and Schindler’s List), War Horse is not a short film, and many would argue that at times Spielberg has been too lax in his cutting. 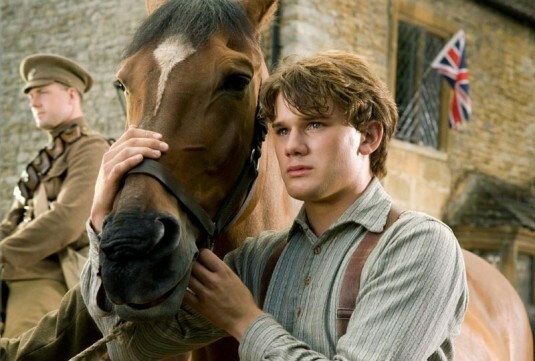 The films opening in Devon, which sets up the closest the film has to main characters, and of course the horse itself, is measured and low-key, and could quite comfortably form the bulk of a less ambitious family picture. We are introduced to the closest the film has to central characters in the form of young Albert Narracott (Jeremy Irvine) and his family, and we are provided with an utterly charming extended prologue of sorts where the bond between boy and horse grows, the threat of war is gradually introduced, and the internal conflict in the family and the financial woes they are in tick away in the background. Much as in the case of films such as The Lord of the Rings: The Fellowship of the Ring, some may bemoan the time spent establishing this quaint idyll and the characters within, moreso in the case of War Horse where many of them subsequently disappear for much of the film that follows, but to do so would completely miss the focus of the film, it’s heart, and in a film where we are later introduced to such a sizeable ensemble of different characters and indeed locations, the time spent with the Narracotts firmly fixes where our hopes and loyalties for a happy conclusion lie. Once the threat of war arrives the films focus remains almost exclusively on that of Joey and, in a manner echoing the likes of Into The Wild and even Forrest Gump, we follow the horse on a series of encounters after he is ripped from his Devonshire home and forced to endure the horrors and trials of the first world war - his journey taking him to a doomed English cavalry charge on enemy territory, to the charge of two young german boys, a stay with an ailing French girl and her grandfather, enduring the cruelty of artillery-pulling through to an unexpected encounter with two enemy soldiers who put aside their differences for reasons I shan’t spoil. Spielberg, along with writers Hall and Curits, do a brilliant job of treating each of these encounters as compelling and distinctly human vignettes with genuinely interesting characters whose stories and plights are surprisingly compelling when considering the short time spent with them. It is here where the original play structure is most apparent, though fortunately the epic scope and stunning cinematography prevent the film from feeling too inhibited by it’s stage-bound roots. Rather, this habit of constantly jumping from one new, mostly-vibrant short story to another keeps the film feeling fresh and rejuvenated, even when the pace of the film itself is clearly going down a gear or two (the scenes with the sick young girl and her grandfather in particular seem to bring things to a much more sedate pace than the preceeding encounters would have had you expecting). If there is one casualty to this structure, it is that the character of Albert, played with a quiet determination yet vulnerable charm by Irvine, disappears for a significant chunk of the film, meaning the resolution to his own story of proving himself and resolving the strained dynamic with his father does not have quite the impact it could. Likewise, occasionally Joey’s involvement in the individual vignettes can be incidental, the focus pulling closer to the new, temporary characters than it does to the horse, who nonetheless proves to be a surprisingly emotive presence, in no short way due to Spielberg having an excellent nack for providing him with the same handling of close-ups and camerawork that would usually be reserved for human characters, helping to further anthropomorphise Joey without venturing anywhere near ridicule or the uncanny valley. (Benedict Cumberbatch pictured above) give solid turns. Speaking of characters and humans, the acting is consistently excellent, with sterling foundations laid down by Peter Mullen, Emily Watson and Jeremy Irvine as the Narracotts, though even players with limited screentime, including the likes of Benedict Cumberbatch, David Kross and Eddie Marsan, are uniformly excellent. Spielberg wisely removes much of the political perspectives on the war, which when coupled with the fact much of the film is from the perspective of Joey himself, goes a long way in both compounding the confusion, mayhem and oppression of the conflict whilst also allowing characters from both sides to flourish as interesting and compelling characters - for every ailing French girl and her grandfather we take pity on there is a young german soldier trying to save his brother from being sent to the frontlines with whom we relate and empathise or a compassionate handler with a genuine concern for the animals in his charge. Technically, the film is superb, and everything from the faultless art direction and costume design, the sweeping score from John Williams (not that anyone with half a wit about them would expect anything less) and the aforementioned stunning cinematography by Janusz Kaminski, all contribute to giving the film its grandiose, classical feel. This is further anchored by the stunning vistas and locales present throughout, and a notable absence of CGI or cheap blockbuster camerawork and effects. Spielberg has played this particular game for too long now to be sloppy about it, and his mastery shines through, both as storyteller and filmmaker. It may not be the most daring or original piece of cinema he has produced, and some may find it overly sentimental and even take umbrage with some of the plot co-incidences, but it nonetheless proves once again that when it comes to giving a cinema audience what they want, he is almost unparalleled in ability. This is one of Spielberg's most beautifully (and masterfully) shot outings. This is a big budget, genuine, extremely well-crafted and utterly beautiful motion picture with the kind of story and heart that again defies any notion that contemporary movies should be inferior in aesthetic, quality or narrative to those that have come before, or that movies of 2012 are somehow cheaper plastic re-imaginings of their superior predecessors. In a time where ‘sequelitis‘ is abundant, the advent of 3D seems to be heralding a rush of re-releases and a focus on the technology rather than story, it is re-assuring to know that a trip to the cinema can still provide you with an incredibly effective, yet oddly familiar and heart-warming, experience such as War Horse.